Holding the Ipu at its neck and striking the bottom-right corner with the base of your right thumb, or tapping with your fingertips, are two ways to play the Ipu. 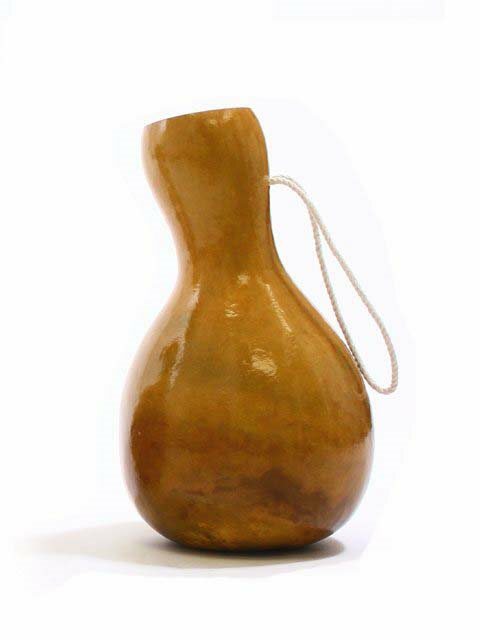 Ipus are natural instruments made by naturally-dried gourds. Due to being made of natural materials, each ipu's shape, coloring, size, thickness, and sound will differ, making each unique. If you would like a specific size, color, etc. for your Ipu please let us know in the "Special Request" section of the checkout page. We strive to accomodate all special requests. The manufacturer hand-craft all Ipus, and we promise to send one-of-a-kind, unique pieces to our customers. *Children’s and X-Large sizes are considered special orders, and may take a few weeks till shipment depending on the availability of raw materials. *Please note that currently the order for the Ipu may take 3 to 4 weeks to ship due to a shortage of the material. *Because the product is made of natural materials, we cannot manufacture all Ipus to be exactly the same size or shape. *Mold may develop due to the natural-drying process of the raw gourd, but can be cleaned and does not render the Ipu defective. In the case of damage or breakage within 30 days of the date of purchase, we will repair or exchange damaged instruments for free. Purchased Item: Ipu (hula percussion instrument) S 20"-23"
Slightly larger than I expected, but great quality. Great product with excellent sound. I will say it'd be better to go for the bigger size to get better sounds if you can afford it. Purchased Item: Ipu (hula percussion instrument) L 26"-31"
Beautiful ipu with good sound quality. Purchased Item: Ipu (hula percussion instrument) M 23"-26"
It is a gift for a member of my hula class. It arrived in excellent condition. I was surprised by the inclusion of a warranty. That has not been offered from any other site I have been on.